Click here to view our Hanukkah Menorahs. Hanukkah is a mid-winter-festival of warmth and light, celebrating the rededication of the home environment at the darkest time of the year. It commemorates the victory of the oppressed Judaeans, under their leader Judas Maccabeus, over the Greeks who had conquered the Jewish homeland and had set up a pagan cult in the Temple of Jerusalem. The beginning of the feast marks the day the victorious Maccabees entered the cleansed Temple for the rededication – which is the meaning of the word Hanukkah. It lasts eight days because the single cruse of consecrated oil that they found was miraculously sufficient to light the large Temple candelabrum for eight days, until more special oil could be prepared by the persists. The idea that the home is a sanctuary, and that it survives hard times unscathed, its crucial to this festival. The main activities are the exchanging of gifts and the kindling of the candelabra with eight lights both in the synagogue and in the home after nightfall on each evening. A single light is lit on the first night, and another added each evening until all eight are burning. A ninth flame is set slightly apart from the others and is used to light them. There is a brief but moving ceremony for lighting the Jewish Menorah, which is called a “Menorah” (lamp) or in Modern Hebrew a Hanukkkiya. In most familiar each person has his or her own Jewish Menorah to light. Everyone stands holding the servant light (called a Shammes or Shamosh by Ashkenazi Jewish, or a Shammash by Sephardics), while blessing over the festival and the lights are recited. There follows a brief prayer as the Jewish Menorah’s are lit. Most families then sing a hymn of thanks for the struggles of liberation fought by Jews throughout their history. The candelabra are usually lit in the window, so that they can be seen from outside. The Hanukkah Jewish Menorah lamp is favorite genre among collectors for a number of reasons. When it is not in use, the Jewish Menorah is often kept on display in the home, so it is a familiar object that has acquired considerable symbolic importance. 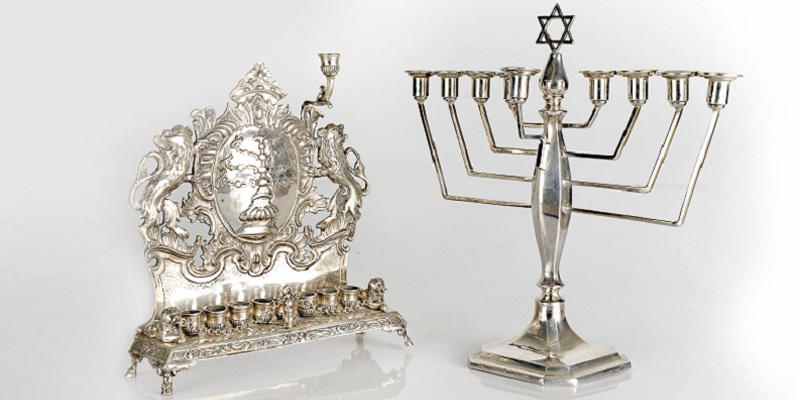 Collectors are perhaps most attracted, however, by the sheer variety of styles available from almost every region in Europe and Asia, Jewish Menorah lamps are made in materials as varied as silver, brass, bronze, copper, pewter, ceramics and glass. They also survive from almost every period, and collectors have no difficulty finding examples from the late Renaissance – the sixteenth and seventeenth centuries – and gradually purchasing a series including specimens of each type dating from then until the present day. Contemporary artists are still producing interesting pieces. Most Jewish Menorah lamps from Mediterranean countries are fuelled by olive or other vegetable oils. Candles have been increasingly popular since the seventeenth century in Northern Europe and are now the most common form of lighting, although some modern makers have chosen to return to oil. The revival of old methods has been matched by a trend towards innovation in materials such as new heat-resistant forms of glass. Such is the popularity of the Hanukkah and its ceremonial Jewish Menorah lamps, that several monographs and catalogues have been produced on them. Best known is the work of the famous scholar Mordecai Narkiss, whose illustrated publications appeared in Hebrew in 1939. But all such works should be treated with discretion since they have been plundered in recent years for designs to reproduce. The resulting copies are often hard to distinguish from the authentic objects, all the more so since many bronze and brass designs were themselves manufactured over a long period between the mid-eighteenth and the nineteenth centuries, so show many slight variations. It is therefore essential to resist the temptation to use published photographs as evidence that a piece is authentic, for the similarity may in fact prove the opposite of what is hoped: you may have a copy taken from the very photograph you believe establishes the authenticity of the piece. Similarly, the fact that examples of a style are absent from the published literature has been used to show that the style is simple not genuine. Many rare and interesting objects have been rejected because of the over-reliance on published material. Every collector should remember that a description and a photograph are not a substitute for real expertise. A few genuine Jewish Menorah lamps have survived since the middle ages, but are extremely rare. They are usually identified as Franco-German, and are dated to between the Twelfth and the fifteenth centuries. They are typically of bronze, with a triangular backplate pierced in a motif that resembles a Gothic rose window. The style was widely reproduced in the late nineteenth century when the demand for medieval objects of all kinds was met by a prodigious amount of copying. If you wish to be sure about the authenticity of a piece, have to wear, patina and construction examined by a specialist in metalwork of the medieval period. Every major museum employs one on its staff. Genuine examples have not appeared on the market for many years, but some no doubt lie unrecognized in dark cellars. It would be a major achievement to discover one. The earliest pieces available to the collector come from Italy. Fine bronze castings played a major role in Italian art of the sixteenth and seventeenth centuries, and Jewish Menorah lamps were cast there in considerable numbers. They have a cartouche-shaped backplate with pierced and chased decoration. Popular themes include elaborate scrolled foliage, occasionally inhabited by putty, or just by their heads, by fantastic monster and grotesques, herms and fruit clusters. All these are borrowed from the Renaissance ornament of the period. One particularly popular scene, often found on European Jewish Menorah lamps of this type from the seventeenth and eighteenth centuries, is Judith holding the head of Holofernes. Judith was biblical heroine who beheaded a Babylonian general while he slept. The was included on Jewish Menorahs, perhaps because her name is the female form of “Judah” or “Judas” – the guerrilla leader who provides the focal point of the festival. She usually appears standing, with a sword in her right hand and a severed had in the left. A little dog that appears in the story is also sometimes included. The backplates are lit by a row of eight oil pans, each with a circular well and protruding lip to receive the wick. The row of pans is cast separately and is secured by projections which fit into slots in the backplate. The projections are locked into place by pins. One sometimes also finds the single matching pan for the servant light, which fits into a slot situated near the top, either in the center or to one side, and is pinned in a similar way. More often the slot alone remains, although when the servant light is lost it is frequently replaced with a copy. This is a common and quite acceptable repair. More radical modifications than this, however, tend to reduce the value of a piece. It is important to check the color of the bronze from which the oil pans are made, and to make sure that the patina and wear match that of the backplate. The row of pans may have been taken from another Jewish Menorah lamp of the right period, but this is very hard to detect. It is not as damaging to the value of a piece as a completely modern replacement. The dating is made harder by the fact that most Jewish Menorah lamps were cast from a common model and sometimes from each other, without any marking, as was the case with silver examples. Old Jewish Menorah lamps seem to be dated almost randomly to the sixteenth and seventeenth, or the seventeenth and eighteenth centuries. Many of them are in fact later. Only a thorough knowledge of the bronzework of Italy at this period can guide you through the problems of dating. If you do not know the field you should go to someone who does. A knowledge of the secular prototypes is extremely important. Poland and the Prussian and Baltic regions of Germany are famous for their brass Jewish menorahs. Free standing examples survive from the seventeenth century, although there is some doubt about their dating, as there is for all base-metal examples. They are decorated with elaborate scrollwork on the upper sections – most are of the branch-and-stem type – and the scrolling terminates in prickets or candleholders often of large size and huge weight. Those up to 5 feet (1.5m) in height and must have been intended for use in a synagogue. They were influenced by Christian candlesticks of the same periods. An eagle is a common decorative motif, as are lions sejant which often serve as supports for the stepped or domed circular base. This form of Jewish Menorah lamp was made throughout the eighteenth and nineteenth centuries and was copied in the twentieth century. The best signs of age are the degree of wear due to cleaning and the size and quality of the screws that join the separately cast parts. The earlier screws tend to be large, with irregular, hand-filed thread, and often have a dot punched in the in order to center the screw itself. This in particular is a reliable sign of age. Jewish menorahs from the first half of the nineteenth century are recognized by the simplicity f the design and the thinness of the connecting screws. All these Jewish Menorah lamps are beautiful and significant, but they are not easy to house, so their very size keeps the prices relatively low. The chief glories of Polish brass Jewish Menorahs are of the backplate variety. The plates themselves are cast and pierced. The Jewish Menorah lamps were made from the late seventeenth until the early nineteenth century. Age can be detected by the overall massiveness of the construction, by the degree of elaboration, by the wear and by the size and precision of the joining screws. Copies can be spotted by the shape edges and pitted surfaces, especially on the back. The backplate tends to be of delicately scrolled tracery including a variety of motifs. Most popular are stags, lions, griffins, crowns and birds – particularly eagles. Meandering branches are even likely to end in serpent heads. Most Jewish Menorah lamps also have decoratively pierced side panels, usually in a latticework style. Sometimes there is a pierced gallery of similar design in front of the oil fonts of candleholders. The servant lights, in the form of large candle-holders, appear at each end, or more usually slightly above the others. It is useful, in the cast of such complex models, to check your piece against published examples to see if there are any sections missing. The front gallery or servant lights have often disappeared. These Jewish menorahs are a firm favorite of collectors, who recognize their solid dignity and the wealth of variety in design. Polish silver examples are also much sought after. A particularly popular version was made in the region of Lvov (Lemberg) during the first half of the nineteenth century. It is known as the Baal Shem Tov type, after the charismatic founder of the mystic Hasidic movement who was said to have owned one. The backplate is shaped like a broad cartouche. Its thin silver is sometimes gilded, but usually decorated with filigree motifs including scrolls containing either a double-header eagle or an arched double doorway that sometimes open to show a miniature Torah scroll. Other motifs include open flowers, pillars, crowns and birds. The front is set with eight oil-containers in the form of miniature jugs, and there is usually a pair of servant lights, each with scrolling filigree stem supporting a candleholder. The Jewish Menorah lamp stands on a number of spindly scroll supports. The front section supporting the oil-jugs is always engraved with a diamond-shaped pattern and hallmarks may be found there also. These Jewish Menorah lamps come in a number of sizes, and range from about 8 inches (20cm) to about 20inches (50cm) in length. Their value depends on their size, ornateness and condition – they are far more fragile than the brass versions, so tare less often in a perfect state. There are a number of variations in the basic design, most of them fairly straightforward. One model, however, has a watch-face in the center, and can range up to 4 feet (1.2m) in height. These are a great rarity and command very high prices. A classic style of Jewish Menorah lamp was produced in Warsaw, mostly between about 1830 and the end of the century. Its backplate is in the shape of a squarish cartouche, and id generally of solid metal, without any piercing or applied filigree. It is often embossed with a vignette of a bird sitting in a bowl of fruit. The upper section bears a crown flanked by birds and flowers. Example of the Prague Jewish Menorahs are still occasionally found for sale. These brass Jewish Menorah lamps originated in the eighteenths century and continued to be made during the nineteenth. Their horizontal rectangular backplate is pierced with scrolling foliage among trelliswork. The top or the sides bear a Star of David, at the center of which appears a hat. This detail may pass unnoticed unless you are looking for it, but the motif has an interesting history. The badge was granted for use by the Jewish of Prague by the Habsburg Emperor Ferdinand II, when the Jews helped to defend the city against an invading Swedish army. The hat is in the style of those of the enemy soldiers. The sides of the Jewish Menorah lamp bear depictions of Moses and Aaron. Between them is a row of oil-pans shaped like spoons. The age of these Jewish menorahs can be discovered using the same criteria as for the Polish brass Jewish Menorah lamps. Austrian Jewish Menorahs are usually of silver and made in Vienna. The most characteristic forms, which were made throughout the nineteenth century, have a hemispherical backplate which is pierced and chased with Rococo-style flowers and foliage. At its center a pair of lions flanks the Decalogue. The detachable row of oil-pans is shaped like a series of spoons – in fact spoons were often used in making the earlier examples. The whole Jewish menorah is set on high, Rococo-style scroll supports. There are a number of interesting variants, including one with a peacock motif which is most rare, and another, which is less so, whose backplate is pierced with Gothic arched and trelliswork, at the center of which is a crowned Decalogue. Holland is famous for its brass Jewish Menorahs, much sought after by collectors. Most are of sheet brass, unlike the Eastern European type which are usually cast. They have squarish backplates with scalloped tops, and are decorated with piercing, punchwork and embossing in variety of designs. These include tulips and other flowers, birds, Stars of David, candelabra and the word Hanukkah in Hebrew. They often have a splendid patina, built up by regular polishing ever since they were made between the mid-seventeenth and the end of the eighteenth centuries. The metal may have worn quite thin in places, and holes may even have been left in raised parts of the design. They range in size from about 8in (20cm) to 16in (40cm) in length. The oldest of them have the most complex and delicate decoration. Some particularly attractive Jewish Menorahs have been produced in the Near East. Reflectors in the form of glass set into brass rings are characteristic, as are backplates decorated with stars and crescents, and with the Hamsa, the sign of the hand which is an important symbol of Islam. These are characteristic of both Syria and Iraq. Iraqi ones tend to be entirely of brass, while Syrian examples are often of brass decoratively inlaid with copper or silver – a technique known to Damascus work. The cross-cultural borrowing in Near-Eastern Jewish Menorahs is particularly complex, making their date and place of manufacture difficult to trace. The twentieth century is notable for the work of the Bezalel School in Jerusalem, which operated between 1909 and 1926. Their Jewish Menorah lamps are in stamped brass and silver, with backplates often decorated with attractive vignettes from the Hanukkah story. The designs are mostly by Raban and other artists. Other modern work is covered in my discussion of Bezalel and other modern artists, such as Schatz, Wolpert and Zabari, whose output draws on the full range of traditional themes and styles. A last word of warning.